Calculate Fault current at each stage of following Electrical System SLD having details of. Main Incoming HT Supply Voltage is 6.6 KV. Fault Level at HT Incoming Power Supply is 360 MVA. Transformer Rating is 2.5 MVA. Let’s first consider Base KVA and KV for HT and LT Side. HT Cable used from HT incoming to HT Circuit Breaker is 5 Runs , 50 Meter ,6.6KV 3 Core 400 sq.mm Aluminum Cable , Resistance of Cable 0.1230 Ω/Km and Reactance of Cable is0.0990 Ω/Km. Total Cable Resistance(R)= (Length of Cable X Resistance of Cable) / No of Cable. Total Cable Reactance(X)= (Length of Cable X Reactance of Cable) / No of Cable. Fault MVA at HT Circuit Breaker= Base MVA / Z Pu-a. HT Cable used from HT Circuit Breaker to Transformer is 3 Runs , 400 Meter ,6.6KV 3 Core 400 sq.mm Aluminium Cable , Resistance of Cable 0.1230 Ω/Km and Reactance of Cable is0.0990 Ω/Km. Fault MVA at Primary side of Transformer = Base MVA / Z Pu-b. Transformer Rating is 2.5 MVA and Transformer Impedance is 6%. LT Cable used from Transformer Secondary to Main LT Panel is 13 Runs , 12 Meter , 1KV, 3.5C x 400 Sq.mm Aluminium Cable , Resistance of Cable 0.1230 Ω/Km and Reactance of Cable is0.0618 Ω/Km. Fault MVA at Main LT Panel = Base MVA / Z Pu-a. LT Cable used from Main LT Panel to Sub Panel is 2 Runs , 160 Meter , 1KV, 3.5C x 400 Sq.mm Aluminium Cable , Resistance of Cable 0.1230 Ω/Km and Reactance of Cable is0.0618 Ω/Km. Fault MVA at Sub Panel = Base MVA / Z Pu-a. LT Cable used from Sub Panel to Motor Control Panel is 6 Runs , 150 Meter , 1KV, 3.5C x 400 Sq.mm Aluminium Cable , Resistance of Cable 0.1230 Ω/Km and Reactance of Cable is0.0739 Ω/Km. Fault MVA at Motor Control Panel = Base MVA / Z Pu-a. The service factor is a multiplier that indicates the amount of overload a motor can be expected to handle. If a motor with a 1.15 service factor can be expected to safely handle intermittent loads amounting to 15% beyond its nameplate horsepower. For example, many motors will have a service factor of 1.15, meaning that the motor can handle a 15% overload. The service factor amperage is the amount of current that the motor will draw under the service factor load condition. Slip is used in two forms. One is the slip RPM which is the difference between the synchronous speed and the full load speed. When this slip RPM is expressed as a percentage of the synchronous speed, then it is called percent slip or just “slip”. Most standard motors run with a full load slip of 2% to 5%. This is the speed at which the magnetic field within the motor is rotating. It is also approximately the speed that the motor will run under no load conditions. For example, a 4 pole motor running on 60 cycles would have a magnetic field speed of 1800 RPM. The no load speed of that motor shaft would be very close to 1800, probably 1798 or 1799 RPM. The full load speed of the same motor might be 1745 RPM. The difference between the synchronous speed and the full load speed is called the slip RPM of the motor. When the motor starts and begins to accelerate the torque in generally decrease until it reach a low point at a certain speed it called the pull-up torque. The Pull-up Torque is the minimum torque developed by the electrical motor when it runs from zero to full-load speed (before it reaches the break-down torque point). Pull-up torque is the minimum torque developed during the period of acceleration from locked-rotor to the speed at which breakdown torque occurs. Some motor designs do not have a value of pull up torque because the lowest point may occur at the locked rotor point. In this case, pull up torque is the same as locked rotor torque. For motors which do not have a definite breakdown torque (such as NEMA design D) pull-up torque is the minimum torque developed up to rated full-load speed. 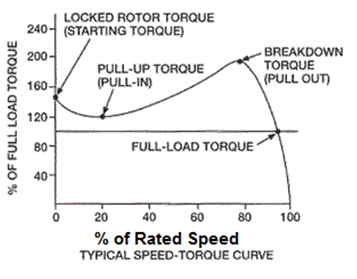 It is usually expressed as a percentage of full-load torque. The amount of torque the motor produces when it is energized at full voltage and with the shaft locked in place is called starting torque. The Locked Rotor Torque or Starting Torque is the torque the electrical motor develop when its starts at rest or zero speed. It is the amount of torque available when power is applied to break the load away and start accelerating it up to speed. A high Starting Torque is more important for application or machines hard to start – as positive displacement pumps, cranes etc. A lower Starting Torque can be accepted in applications as centrifugal fans or a pump where the start loads is low or close to zero. Full load torque is the rated continuous torque that the motor can support without overheating within its time rating. Many types of loads such as reciprocating compressors have cycling torques where the amount of torque required varies depending on the position of the machine. The actual maximum torque requirement at any point is called the peak torque requirement. Peak torques is involved in things such as punch presses and other types of loads where an oscillating torque requirement occurs. The load is then increased until the maximum point is reached.